We use them a little bit differently from the typical river hike, and that is why when we first laid eyes on the Castaway XL and Twain, we were enthralled. A fin, storage, and a spray deck option? Now we are talking possibilities. 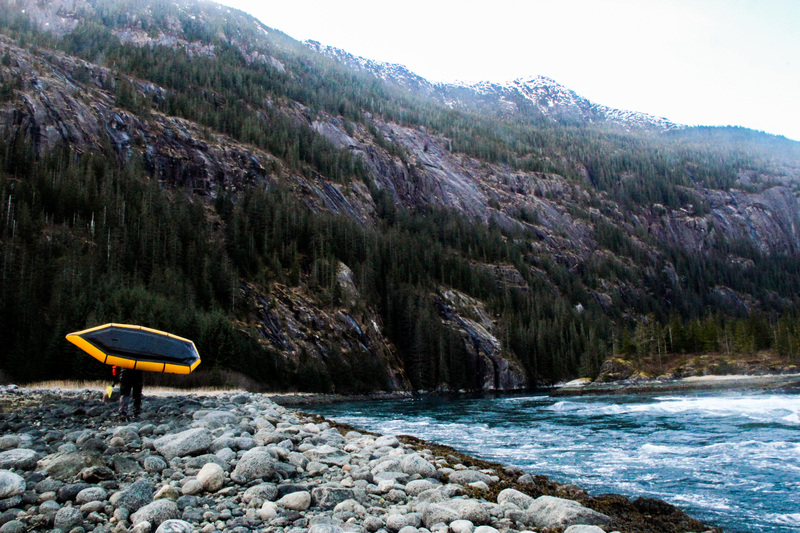 The standard issues of speed on a packraft tends to lee on the side of misery for longer paddle trips where a packraft’s desire to turn can be more tiring than the trip itself. It is amazing how big of a difference a little fin can make. Our sailing tours cover a lot of ground here in Southeast Alaska. 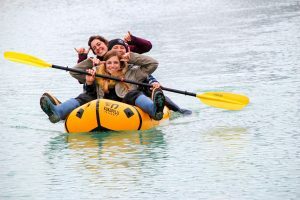 Whether it is cruising along the glacial fjords or bouncing around hot springs, exploring the shoreline by paddle craft is a big part of these tours. 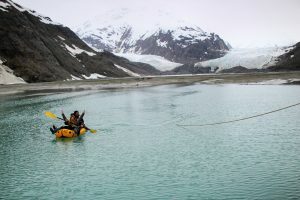 We often spend just as much time paddling as we do going ashore to investigate some interesting ice, wildlife, or water fall. And this, this is where packrafts win hands down. With steep mountain fjords and rocky shores, landing a rigid boat is downright terrifying for a new paddler, not to mention the damage it does to our boats. Weighing in at about ten and a half pounds, a reasonably fit 75 year old guest can land, grab their boat and pull it ashore, or even up the sailboat. One of the big factors for us on board a 54 foot sailboat is space. With enough kayaks for 6 guests, a guide, and sometimes the captain, we would lose all of our deck space. 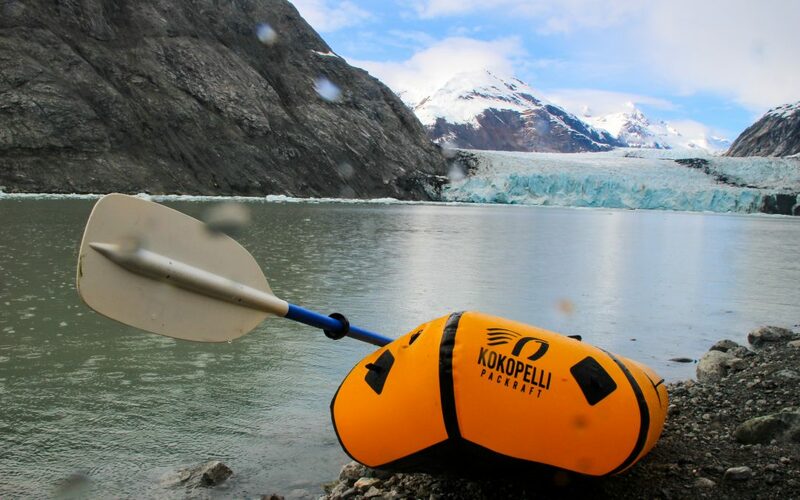 With a comparably sea worthy replacement of Kokopelli’s touring packraft series, we don’t have to give up space or adventure possibilities. Coming in just under a grand with all the whistles and bells was enough to convert him. Adventure Flow Co-Founder Patrick Courtnage walks up the mouth of the Fords of Terror to have his first go on a tidal bore. Just toss it over your shoulder and go! 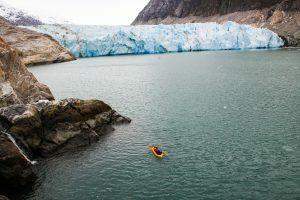 Before, in a kayak, there were so many things that we looked at and past by simply because the reward for the amount of effort to get a kayak there were too little. 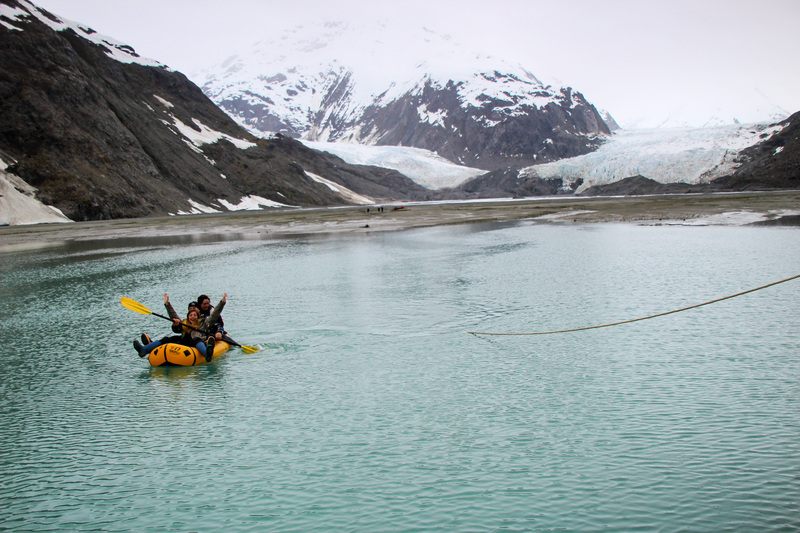 But being able to just pick up the boat has greatly increased what guests can accomplish. Instead of one run on the tidal bore, we can run laps. 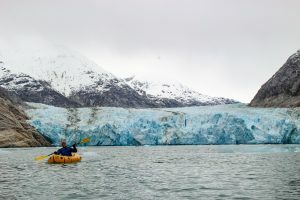 While we have a motorized raft on the boat, it is often overkill up here where shore might be less that 100ft from our anchorage. Add to it that our tides average around 16ft, carrying a motorized raft out of the tide, or tying it down often aren’t easy. These boats make an easy method for moving to and from an anchored boat, especially for smaller sailboats and skiffs that can’t afford a secondary boat to get to shore. Guest Jim and Diane set off back to the boat after a hike with Captain Hoock, It was the only boat we could get them to paddle together in! Diane and Jim enjoyed the Twain for another reason that we love these boats, comfort.They enjoyed the added padding when bouncing along rocks that you as the paddler tend to absorb in a standard kayak. Inflatables are often surprisingly less comfortable than their rigid brethren, but these tour packrafts are amazing. With such a versatile, stable, comfortable, affordable, and burly craft, it is hard to see us going back to rigid watercraft. 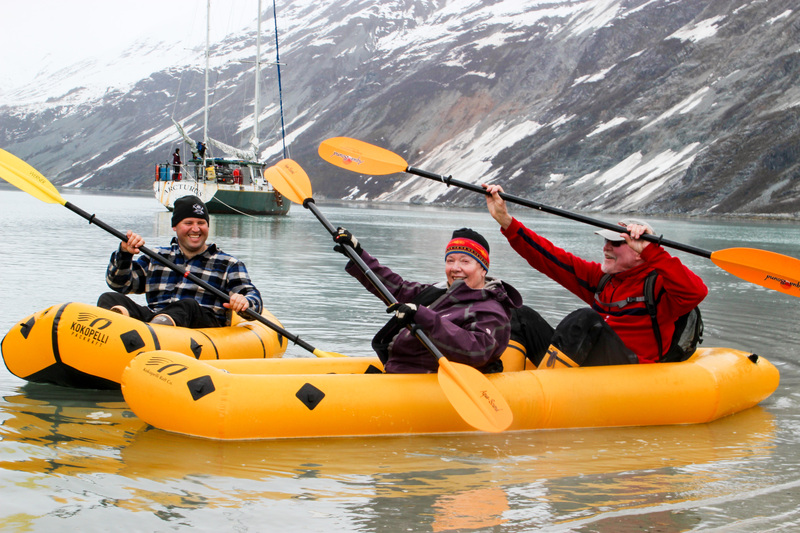 The ability to have a boat on call, in the car, boat, or plane expands our guests possibilities whether they are 8 or 80. So what are you waiting for? Get out there and explore! Don’t limit yourself by the hassle of lifting a heavy boat. Grab your boat. Inflate in 5 minutes, and be on your way to a fishing spot, the other side of the channel, or a new adventure!